Microsoft Dynamics AX is an enterprise resource planning (ERP) solution that helps enterprises increase the speed of doing business. 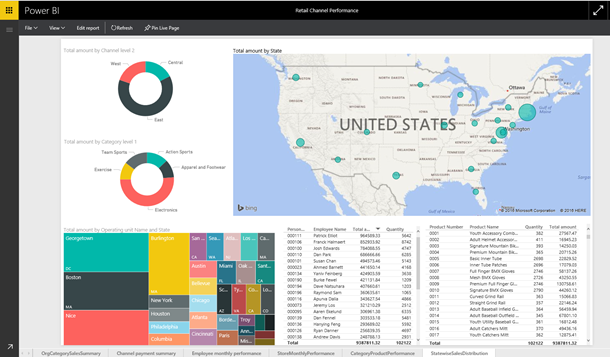 Last week at the Dynamics AX Technical Conference, we were excited to announce the availability of two Dynamics AX 7 content packs for Power BI: Financial Performance and Retail Channel Performance. The Financial Performance content pack, designed specifically for CFOs, provides access to insights about your organization’s financial performance. The Retail Channel Performance content pack is for channel managers who focus on sales performance to predict trends and uncover insights by drawing directly from Retail & Commerce data. This post will explain how the Power BI content pack can help you analyze your Microsoft Dynamics AX data. For additional details on how to get started, please see the Dynamics AX content pack for Power BI help page. To connect to either of the content packs, simply provide the URL to your AX 7 environment and sign in. 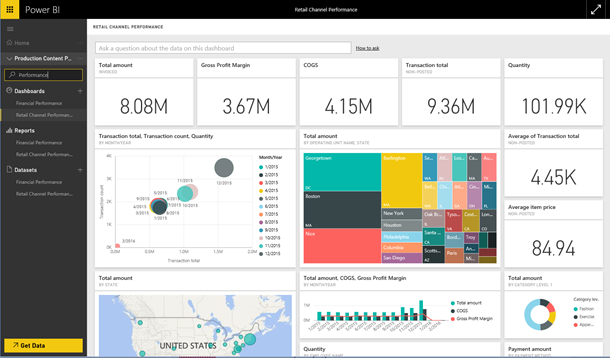 Once the connection is complete, Power BI will automatically create a dashboard, report, and dataset with data from your Dynamics AX account. The out-of-the-box dashboards offer an overview of the insights included in the content pack, and you can select any of the tiles to drill into the multiple pages of reports behind the dashboard. In the Retail Channel dashboard, you can select the Total Amount tree map visual to drill into the Statewise Sales Distribution report page. This report shows an overview of sales by location, channel, category and more. The report allows you to hover over the visualizations to see additional details and select a visual to cross filter the rest of the page to drill in further. In each report you can switch to edit mode, where you can edit or add additional visuals to your reports. On the right, you’ll see a list of all the tables and fields you have access to in the content pack. Editing the Expense Analysis page in the Financial Performance report shows the seven different data tables included in the content pack, as well as the fields used for each of the visuals. From any of the reports you can pin visualizations or tiles to the dashboard by hovering over them and selecting the pin icon. Pinning the visuals will prompt you to select a destination dashboard, allowing you to customize and bring in data from multiple sources. After the initial import, the dashboard and the reports continue to update daily with the latest content, and you can control the refresh schedule on the dataset. 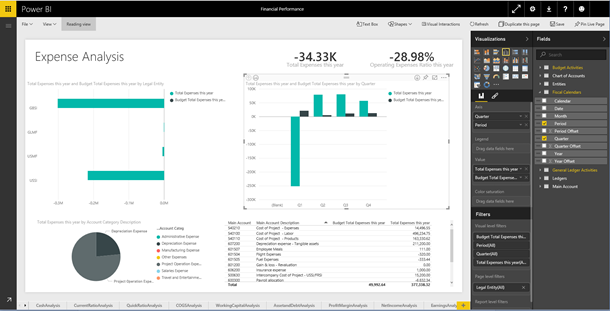 With the Dynamics AX content packs for Power BI, you have an initial set of insights for your Retail Channel manager and your Finance manager to explore your Microsoft Dynamics AX data even further.